Do girls at school still wear bloomers these days? Or is something that finished with my generation?Does anyone else remember wearing bloomers? Maybe it was just a WA thing. They look just like underwear, but we used to wear them over our underwear and that is what we would do school sport in. They were a little bit more modest than underwear, and you could feel pretty secure that they were going to stay where they were supposed to. But, none the less, they were still basically underwear. If you have never heard of them I bet this is sounding pretty strange right now. I was reminded about bloomers this weekend when we were catching up with friends and somehow we started talking about them. 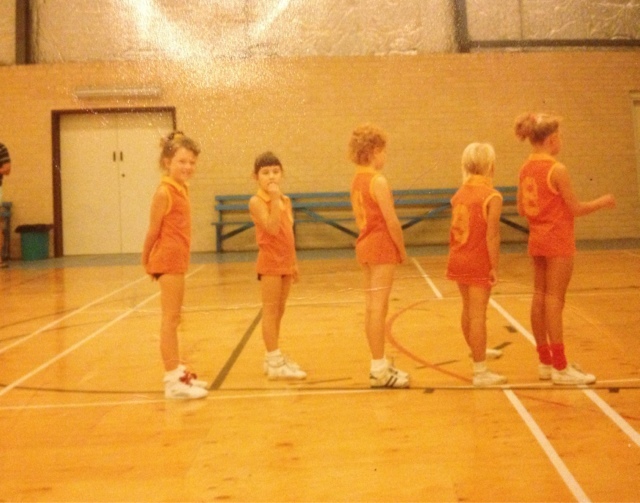 I remember specifically that when I played Basketball as a kid, the rules at our stadium were that girls were not allowed to wear shorts, they had to wear bloomers that corresponded with the team colours. So here I was, skinny little short kid with chicken legs, in huge 90's style sneakers (probably my awesome LA Lakers or the Reebok Pumps that were too big for me that I inherited from my older brother, but thought they made me play soooo much better) and just bloomers and a basketball tank top. I must have looked pretty ridiculous, but then again, so did everyone else. By the time I became old enough to be self-conscious and aware of the fact that it was kind of weird to be playing basketball in my underwear, they had changed the rules and I got my very own brand new pair of basketball shorts. But, there were girls who were in their late teens playing in bloomers, just recently this has struck me as being kind of strange. Why were they so adamant that girls couldn't wear shorts or even skirts like tennis? So, so weird. To prove that I'm not making it up, here is a picture. I'm the one with a big fringe and my hand in my mouth, second from the back, trying to be cool while my Dad takes my picture. I really want to know if bloomers were an Aussie wide thing, or just something us Perthites did? 18 comments on "Who remembers Bloomers?" I know what you're talking about, but don't remember wearing them on their own. Under my skirt maybe? Or maybe that was before my time? ;-) HA! Thank god they're not made to dress like that now! Could you imagine?! We called them 'runners' or 'bummers' at our school, and mostly wore them under our pleated skirts to school. They were the main gear for athletics carnival though (you wouldn't want a skirt swishing around) before bike pants came in. Shorts would have been so much better! We had them in nsw but we called them scungies. Attractive name. I can remember swinging upside down on the monkey bars and not worrying cos I had my scungies on. We had bloomers in NSW in the 1970s/80s, but perhaps they were a little bit different. Ours were made out of the same fabric as the tunic or dress we wore, and really were bloomers - puffy pants that came in with elastic at the top of the legs. They were the precursor to 'scungees', which were spandex-type big pants in black (though you could also get them in fetching shades of bottle green and navy). Yep I remember whipping off the skirt at athletic carnivals, of course the skirt held us back so much!! The name 'bummers' is awesome! Those type of bloomers are awesome!! (And so cute on little kids). Our bloomers were those same spandex pants, I even saw some in red and maroon, you know to match the school uniforms!! YES! In Qld, my high school sports uniform was a gingham check dress with matching bloomers. We HATED them, but the senior mistress would make us all stand on benches and would LIFT OUR SKIRTS using her brolly to check we were wearing them! Nowadays wouldn't that be considered totally inappropriate??! Man that is wrong on so many levels. I like the way one girl has one long enough to be a dress, good thinking there. I remember these, only we called them sports briefs as we wore them under our sports skirts. I am originally from South Africa and we used to have to wear bloomers for sport - but they were worn under our sports skirts - apparently it was OK for everyone to see our bloomers but not for them to see our knickers !!!! Thanks for the memories ! Have the best day ! Ah.. memories! We had bloomers! Wow.. that was an eternity ago! Thanks for the trip down memory lane. I wet myself once, wearing them.. it went all through my socks and shoes on the netball court because the toilets were too far away and I didnt make it. Embarrassing! This is really an awesome and a fabulous stuff that you have shared and i am really impressed by this working. styles, to the traditional sweatsuit.